Dr. Shelby Motoligin obtained her Doctorate of Veterinary Medicine from Michigan State University (2017). She also has a Bachelor of Science degree in Animal Science from Michigan State University (2013). Dr. Motoligin joined AEC in 2017 and is a member of the MVMA, SEMVMA, IVECCS and AVMA. Dr. Motoligin has always had an interest in medicine, but it wasn't until 4-H that she realized she wanted to pursue a career in veterinary medicine. Dr. Motoligin was an active 4-H member for 8 years and was involved with a variety of small mammals, goats, swine, poultry and bovine. These experiences raising and showing animals led her to realize that she wanted to dedicate herself to treating animals. While studying at MSU, Dr. Motoligin spent two summers working at an emergency and specialty referral hospital, and that sparked her interest for emergency medicine! 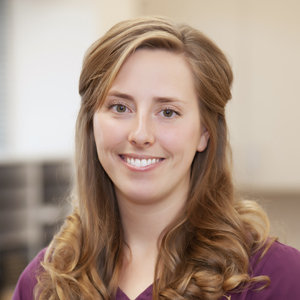 She became an active member of the student surgery club and also served as treasurer and active member of the student Veterinary Emergency and Critical Care Society. "What I like most is the science behind the medicine, and how we can utilize various diagnostics to formulate a treatment plan that can ultimately help save an animal's life - that is as rewarding to me as the veterinarian as it to the pet's owner! Medicine is like a puzzle - it's challenging, but it can be fun once a problem has been solved!" "Nowadays, companion animals have such a strong influence in the household and are essentially a member of the family to most. I feel that it's important that these families have someone they can trust when their pet is in need of immediate medical care. I take pride in knowing that I can be there for those families during difficult times and be someone they can trust to be honest and provide the best medicine and care for their pets. Dr. Motoligin 'secretly' has an interest in large/farm animals - she hopes to one day have a small hobby farm with a horse, cow, and lots of chickens! She currently has a Soft Coated Wheaten Terrier named Daisy ("the best pal anyone could ask for!") who was her sidekick all throughout vet school. When Dr. Motoligin isn't at work she is usually out on the water with her fiance boating or kayaking or enjoying the outdoors biking, hiking or cheering on her Spartans... "Go Green!"